I was raised by a mother who gives and gives and gives — the look on her face when she sees the receiver full of happiness is priceless! It’s amazing to see: someone experiencing real joy in giving; receiving gifts have never made her as happy as I have seen her when she gives… That’s the mother that raised me, and that’s how I was raised. 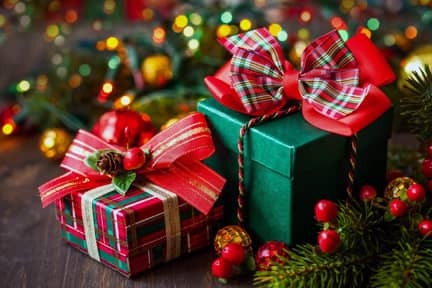 I was also taught that you never ask for gift from anyone. You graciously accept whatever is given to you and you appreciate the thought, effort and sacrifice that went into the gift. In recent years, our family has done a “Secret Santa” gift exchange amongst cousins. I’m disappointed in the direction it’s taken this year. We’ve typically had a maximum dollar amount for the gifts, something like a $10 maximum or so. But this year, my cousins have decided to change it to a minimum of $15. I think about one of my uncles who has four elementary-school-aged boys who’s now obliged to shell out a minimum of $60 just so his kids can participate and not feel left out. That’s a pretty hefty burden when you consider how expensive Christmas time can be with children. All I want for Christmas is my real family back: the ones who wouldn’t even dream of writing anything like that. The ones who would concern themselves more with what they were going to give than what they wanted to receive. The ones who believe that it’s the thought that counts, not the gift itself. The ones who would also remember to think of the needy at Christmas time. Where did my family go? It’s sad when people forget the real meaning of Christmas and pervert the holiday in such ridiculous ways. It’s too easy to get lost in your own world and immersed in excess when things are going well. In order to force ourselves to think about the less fortunate at Christmas time, Michelle and I decided years ago that we would never buy gifts for each other at Christmas time. Instead, we would try to donate as much as we could and focus on spending time together and giving each other the gift of our company. So far, it’s been wonderful for us. This Christmas season, try to think about the kids who don’t get a Christmas. Think about the kids who’s Christmas wish is for nothing more than to have food on the table. The kids who ask Santa for a safe home and nothing else. And think about the parents who sacrifice everything, work extra long hours and lose sleep, just so that they can afford to give something to their kids from Santa. All I Want for Christmas… was published by Daniel Menjívar on December 10, 2007 at 3:58:25 PM MST and last updated on April 18, 2019 at 4:40:38 PM UTC .